When it comes to outdoor activities and entertainment, nothing beats investing in a solid projector. Regardless of whether you are looking for the budget outdoor projector or just wanting to have the best outdoor movie projector overall, we have several options for you. Numerous outside movie projectors are available in the market and are considered which you can choose to complete your digital outdoor requirements. In this article, we will talk you through the outdoor projector guide by discussing various projectors based on thousands of reviews and research which you can buy to fulfill your requirements. This article includes everything that you want to know before buying the amazing outdoor projector. Here is the complete list of top 10 of the best outdoor movie projector which fulfilled your requirements and helps you make a decision that which projector is best for you. NOTE: You can also check the affordable outdoor projectors, low budget projectors and an average range of projectors screens here. We can make the ideal list of best outdoor movie projectors 2019 that helps you to decide which outdoor projector is best in the market. 12.1 Where I can find the replacement lamp, bulb or light bulb? 12.2 How can I set up or install my projector? 12.3 Why my projectors are producing a lot of noise? 12.4 Why my remote control is not working? 12.5 Why the pictures aren’t bright enough? The first pick on our list is Optoma HD27e which is considered on top in our list of the best outdoor movie projector and is a slightly upgraded version of the widely popular projector original HD27. The HD27e falls well into this list considering the cost and what it is offering in the current market. The focus wheel is quite smooth with the ridged texture as the plastic is of good quality. The IR sensor on the projector is better and more responsive than the earlier version. The build quality and overall design are quite compact and appealing. The buttons might feel comparatively small but good enough to press. The back of the projector consists of a block section which is fully open on one side which ultimately allows more air flow but produces modest noise. In terms of rear port selection, the HD27e has you covered as we can find two HDMI’S (the second of which has USB support) along with 12-volt trigger for your audio input. It is also perfect if you have some 3D Blu-Rays due to its 3D sync. The Optoma HD27e just like the other optimum projectors contains two adjustable feet, one located at the front and the other at the rear along with a fixed foot. It also performs well in terms of gaming performance, at only 16 miliseconds it is more than capable of connecting an Xbox or a PS4. The Epson Pro EX0220 is a wireless portable projector which comes with enhanced features and increasing connectivity. It doesn’t matter even if your places are lighted with the help of Epson pro as its projection of the images is extremely vibrant and glowing. The quality of the image and the video is formidable due to its 1080p (1920*1200) resolution. The settings further enable you to manage it according to your personal preference as it offers several modes such as color temperature, tint, sharpness, image enhancement, contrast, brightness, cinema, dynamic, presentation, SRGB in color mode and automatic image optimization based on the brightness of the projected content. Epson Pro EX9220 supports MHL enabled devices for charging and mirroring the video on both screens. The Epson pro ensures availability of numerous software tools for this model. There is an option to download the applications from their official website or either from the CD that comes along with the box. After downloading the application from the play store or app store, you can use your smartphone to control the projector by turning it into a remote controller which ultimately also enables you to use the feature of screen mirroring. 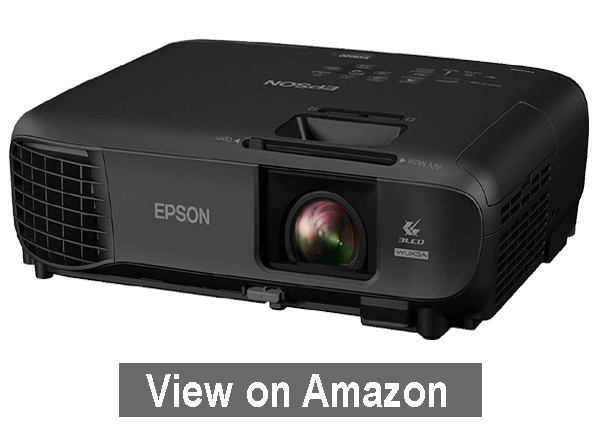 The Epson pro is on 2nd in our list of the best outdoor movie projector and is extremely effective whether you want to utilize it for watching movies or delivering presentations as it is equally competent and effective. Sony is a giant and undoubtedly one of the best companies in the market and is specialized in gaming, manufacturing, entertainment and electronic products which are known for their quality and durability. 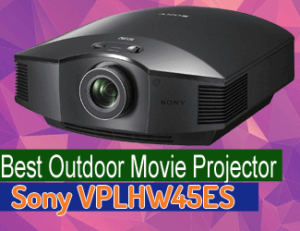 The Sony VPLHW45ES performs equally well for gaming projector or wanting to have the best outdoor movie projector making it an ideal option even for the most demanding users. From a design perspective, it measures 16.1 inches in width, 7.1 inches in height and 18.3 inches in length and weighs around 9 kilograms. The whole shape is accompanied by gentle curves and sharp angles along with interesting piano black shape which makes it suitable enough for any décor. The projector performs relatively good when it comes to the venting of hot air since it vents from its front edge giving you the opportunity to place it against the wall without any problem comfortably. On the left side, there are two HDMI inputs which have an HDCP compliance and then higher input with an rs-232 connector which is useful for having external wired remote control as well as the USB port that is strictly for firmware updates. 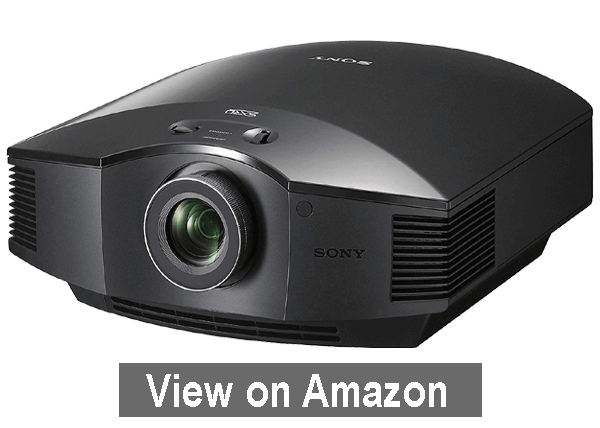 Sony VPLHW45ES has 1800 lumens of brightness which works perfectly with the 215-watt lamp delivering clarity and vibrant imagery for transforming your home into a cheap real theater. The picture quality is insanely good because of numerous features such as the color space, smooth gradation, MPEG noise, reality creation, motion flow (necessary to be considered as best outdoor movie projector) and the input lag reduction which gamers are going to find very useful. More detailed and sharper picture from the previous model. Motion handling smoother as ever for sports. Works great for movies and gaming. Fan noise is slightly louder. 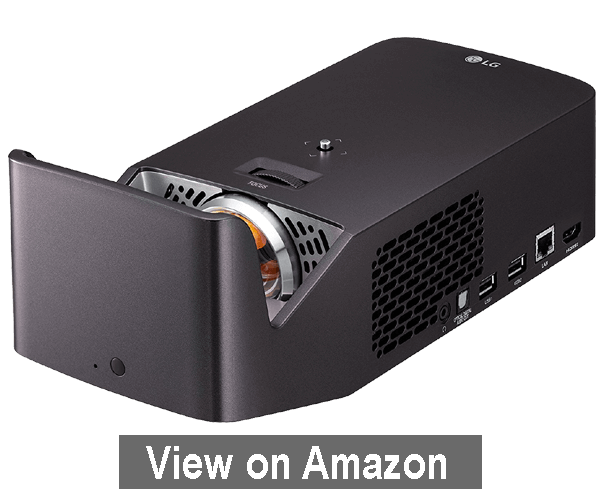 On the off chance that you require a high-resolution business projector for demonstrating comprehensive and detailed images, the InFocus IN119HDx might just be a perfect choice. It joins a low-cost full HD 1080p resolution, and it is also an outdoor projector under $500, displays reasonable brightness for a little to-moderate size room, and is additionally light enough to carry around. The InFocus claims the brightness of the outdoor projector screen is at 3200 lumens which is bright enough with a 1.0 gain screen in a theater dark lighting. In the case of smaller screen size, the brightness of the projector can be dimmed by using the Eco mode feature. Its high resolution is extremely favorable and is equivalent of any best outdoor movie projector. The InFocus is exceptionally useful when there is a need to display minor details on the screen. The resolution of 1080p will give you a sharper and more detailed image whether it’s a film, video or a photograph. The brightness of the projectors in the classrooms or conference rooms is primary which is because of the reason that the projectors project light and they don’t actually project black. Whenever there is a presence of a light in the room the projector needs to emit more light in order to create the illusion of blackness and the InFocus generates bright light with the help of its operating modes offering light output ranging from 2400 lumens to 900 lumens. The number five on our list is ViewSonic PRO7827HD which delivers all you need for a real cinema experience from the comfort of your home. The projector with the help of exclusive RGBRGB color wheel design meets SRGB and REC709 standards for vivid cinema accurate colors you expect to get only at the movie theater. In addition, the Darkchip3 enhancement technology ensures incredibly sharp and crystal-clear images. A short throw lens delivers large images in any sized room which ultimately enables you to go big in your home with a wall-filling giant screen size up to 150 inches which is why it is also regarded as the best outdoor movie projector. The super color technology with a stunning 1080p resolution and Sonic expert enhanced speakers all bring action-packed movies and video games to life with the perfect front of screen performance and room-filling sound. Smart and convenient design features include PortAll, a hidden MHL HDMI port that lets you discreetly stream multimedia content from a variety of wireless dongles including Google CHROME CAST, ROKU streaming, and Amazon fire tv stick. The ViewSonic Pro enables you to expand your home entertainment experience whether playing video games, projecting movies from a Blue-ray player or wirelessly streaming videos from a mobile device. You are bound to have an unforgettable experience with this accurate and widely regarded as the best outdoor movie projector. Vibrant colors with several modes for settings. Incredibly sharp and refined images. Suitable for home entertainment and gaming. Best projector for outdoor movies. No manual included in a box. 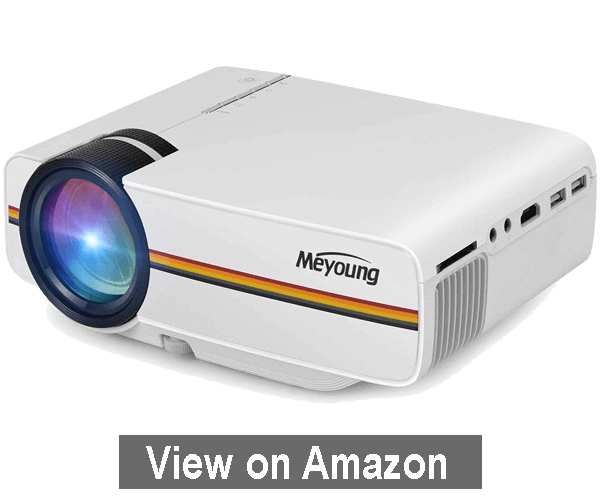 The Meyoung TC80 is one of the best choices for projecting your favorite media where ever you like. This model is extremely portable that can connect with ease to any HDMI labeled device including smartphones. If you get the right adapter as a home theater unit, the TC80 is highly recommended due to its vivid colors, many inputs, and the powerful built-in speaker. For a perfect full HD experience with beautiful visuals, the projector has been upgraded in terms of luminous efficiency. It supports movies and video games projected on a 50~130 inches big screen and HD. Meyoung mini projector is an excellent high-performance device for creating a cinematic movie experience at home. The resolution is although satisfactory for entertainment purposes but not precise enough to display text. For this reason, this model is not recommended for powerpoint presentations but an excellent choice especially for outdoor movie nights. In terms of image quality, it really stands out and can deliver surprisingly crisp colors even on improvised screens. Lastly, the mini projector is the only outdoor movie projector under $100 and also compatible with SD card, USB flash drive, Mobile HDD to play videos, pictures, and music. It also comes with a built-in speaker and a powerful amplifier along with it. Perfect choice for outdoor movie nights. Excellent image quality, vivid and sharp colors. Slow noise and runs less hot. Best outdoor movie projector at a low cost. Claims of sound not being great. The Optoma UHD60 is number seven on the list of the best outdoor movie projector. Optoma UHD60 is an exceptional home amusement projector equipped for taking care of practically every one of the 4K content, and also, taking care of traditional 1080 resolution content. The color is in general excellent, apart from the brightest mode (obviously), which is quite revolting, just like the case with general projectors. The fact of the matter is, you won’t probably be utilizing that mode; however, producers or manufacturers necessitate including that type of mode (once in a while called native lamp mode). Since it yields the most significant number of lumens possible as Optoma UHD60 is capable of displaying up to 3000 lumens. If that particular mode is your core requirement than don’t purchase this projector, or either you can match your room space to the appropriate screen so you wouldn’t need to bother with that mode. Keep in mind; it’s critical to coordinate the screen to your projector, however more significantly to the room conditions and sort of viewing you acquire. There’s a significant distinction between sports with moderate ambient light and a movie with practically zero ambient light. Optoma UHD60 is a compatible projector which means it can accept the REC 2020 HDR signal although the overall brightness of the picture and color vibrancy is better with REC 709. This Optoma projector is better at displaying sports/television viewing with surrounding light than it is with the movies in the dark. That is a direct result of the extremely solid measure of brightness levels accessible (for sports, and so on) and not as much as extraordinary dark levels. The black levels mean extremely dark scenes (which are numerous in many films) will endure suffering as compared with the projectors that are better. It is fair to say that extraordinary dark level execution projectors simply aren’t anywhere near. Doesn’t have an RGBRGB color wheel. The Epson home cinema 5040UB can be your choice if you are looking for a best outdoor movie projector. 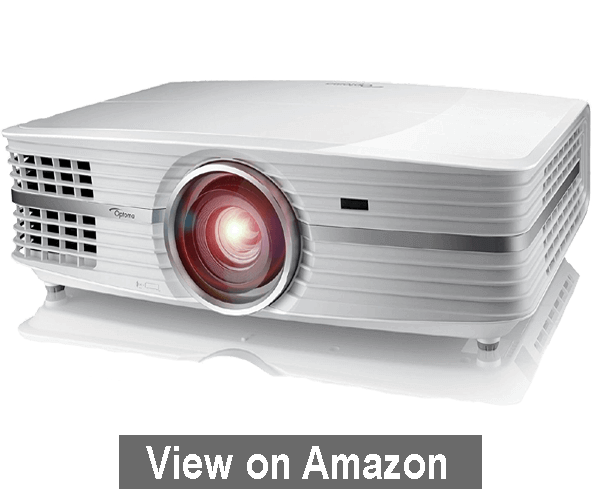 It is a 1080p and the least expensive home theater projector that handles the 4k content and uses pixel shifting to take advantage that produces an impressively sharp and detailed image. 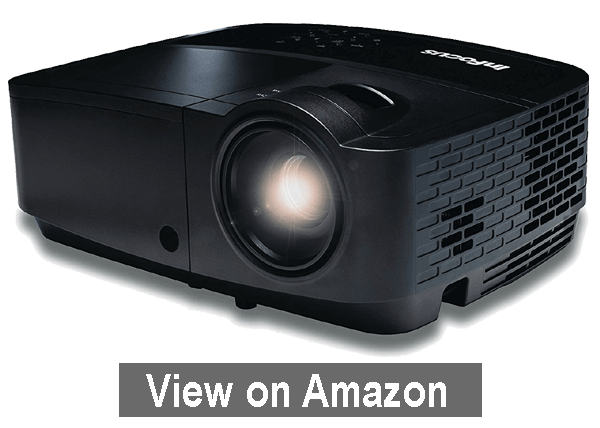 Epson home cinema 5040UB 3LCD home theater projector contains much improved 2.101 zoom lens that is not only optically superior to its predecessor but is also fully motorized which is exceptional if you are looking for a best outdoor movie projector. Having lens memory allows you the luxury of going with a widescreen which is a real advantage if you are looking for a best outdoor movie projector and HDTV or streaming. Epson claims the lamp life of 3500 hours at full power, 4000 at average and 5000 hours at low power eco mode. It uses a cinema filter when it is in its best modes resulting in calibrated brightness around 900 lumens which is more than enough for a typical 120-inch diagonal screen. The sound of the fan is barely noticeable in the eco mode as they produce 20db of noise but can be slightly noisy in the performance mode. The 5040UB is also an excellent option for play gaming as it has an input lag of 30.8 milliseconds. The startup feature is useful and ensures the screen and the picture is always in line. Unlike other LCD projectors, this model doesn’t show any rainbow effects. Widely regarded as the best outdoor movie projector. Lamp life is average compared to the cost. The LG PF1000UW enables you to have a cinematic viewing experience at your home as it’s widely considered as one of the best projectors in our list of best outdoor movie projector due to its full HD 1080p picture quality. 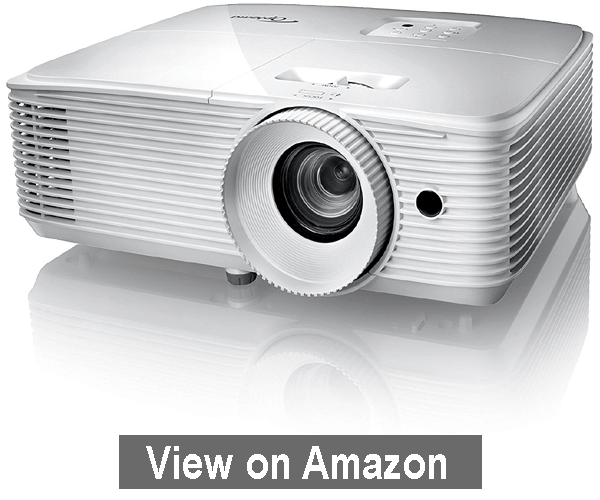 It allows you to have a picture up to 100 inches and releases 1000 lumens brightness and 150,000:1 contrast ratio. This model as clear from the name is capable of ultra-short throw projection and ultimately delivers bright and vivid imagery within a short distance from the surface where it is projected. You can place it just 5 inches away in order to get 50 inches of vivid viewing and farther accordingly to get up to 100 inches images. The LED illumination system is extremely efficient and shows natural and sharp colors along with the capability to last for an estimated 30000 hours. The Bluetooth connectivity allows you to connect speakers and headphones of your choice to match the viewing experience with excellent sound quality. The smart tv from LG is easy to set up as you can have access to premium content from the popular providers. The Lg ultra-short throw comes with a remote control which makes your navigation fast and easy as ever. The color balance is exceptional. Picture quality is better than ever. Primarily considered as the best outdoor movie projector. 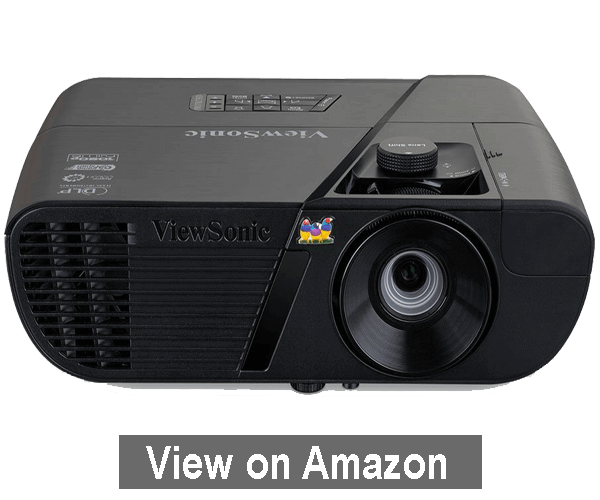 The last pick on our list for best outdoor movie projector is ViewSonic pro 7828 and is what you can call a multipurpose projector and can be contemplated as the best outdoor movie projector. 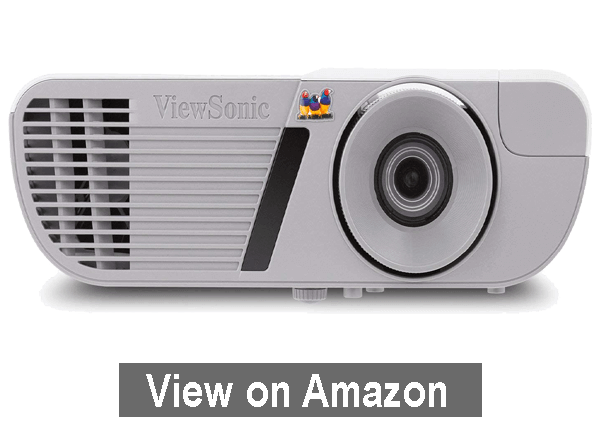 ViewSonic PJD 7828HDL has features both associated with an office environment as well as using it as a home theater projector for your setup. The best outdoor movie projector contains a DLP chip that comes from Texas instrument and specifically this model uses the dark chip 3. The necessary improvement in this feature are the gaps between the mirrors are smaller, and the surface of each mirror is supposedly flattering which gives you a more refined image. It will also give you a 25% increase in native CR. 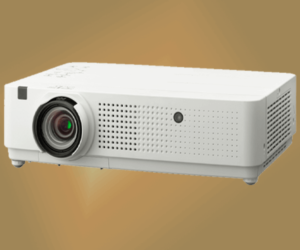 The projector also delivers high contrast with much less in the way of light transmission defects. The color wheel on this projector is an actual RGB CYW. Furthermore, this projector is capable of displaying true blacks and creates a relatively impressive image, and it works smoothly especially where you get dark to light scenes simultaneously. The screen size is between 30 to 300 inches and with an even better distance of about 2.5 to 2.6 meters which means you’ll get 100-inch screen easily. The streaming is smoother as ever with the Google Chromecast along with a very little latency. In terms of rear I/o, there is an audio input/output, S video port, air video input, a 2.0 USB port and dual HDMI’s and latter of which has another MHL supported port. The contents which are included with the projector are a software CD with some basic instruction manual, some batteries, a VGA cable along with remote control. The ViewSonic has done an excellent job to give users as much control over the projector to get the perfect image to suit their environments. Lastly, the white blinds don’t actually stop much light and don’t make any difference whatsoever which makes it even better to be labeled as the best outdoor movie projector. Short throw lens delivers massive images. Perfect for both home theater and office environment. Where I can find the replacement lamp, bulb or light bulb? The replacement of the light bulb can be found and bought on Amazon from various lamp dealers. Just type the brand of the projector you own, and it will take you to the list to choose. How can I set up or install my projector? Most of the projectors come with an instruction manual or a Cd which includes all the specifications and directions for setup. Why my projectors are producing a lot of noise? You need to check at which mode you are operating your projector. The fan speed is louder on the brightest settings mode and normal or extremely less in eco mode. Why my remote control is not working? Ans: The batteries might not have been inserted correctly, or they have gone weak. Another reason for this could be that your remote control is out of operation range. Why the pictures aren’t bright enough? The contrast must be set to standard to achieve the highest picture quality. If you require a higher luminance, set your lamp power from eco mode to normal. There are numerous options for the best outdoor movie projector in various products that are available in the market which you can choose to buy according to your requirements. The above-listed recommendations are our top picks based on thorough research for best outdoor movie projector and can accommodate all your demands. 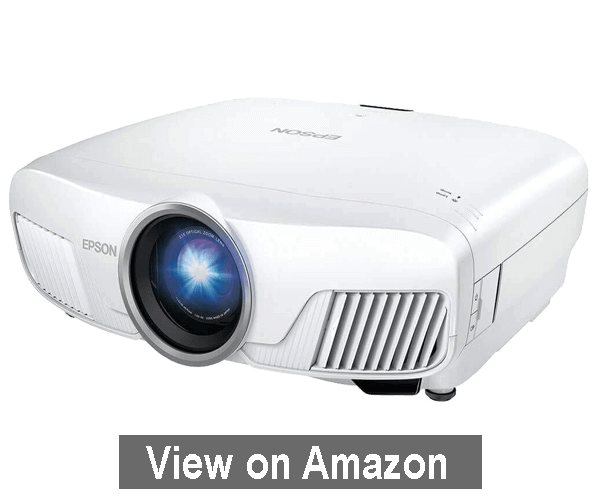 If you are looking for a projector that is both cost-effective and fulfills all your basic needs then you can opt for InFocus Corporation IN119HDx and if cost is not an issue and you are willing to spend to get the best professional results possible then one must purchase Epson Home Cinema 5040UB. In short before initiating a purchase for a best outdoor movie projector, one must assess his/her core requirements that whether you want the best picture quality or wanting to have the best user experience overall as it is a long-term investment and must be pondered upon.